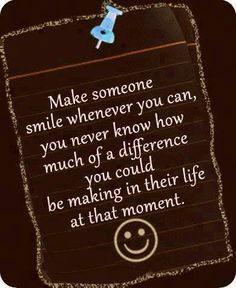 It’s amazing how a simple smile can change someones day. Something we don’t normally think twice about can make such a huge difference in someone elses world. We never really know what others are going through in their lives or in their thoughts as we pass them by in our day. We often jump to quick conclusions that they are bitchy, grumpy, mean people, but how do you know whether or not they are worried about paying their bills, feeding their children or mourning the loss of a loved one. We tend to get caught up in our own worlds and forget to look around at the people in the world we truly live in. Taking a moment to make a small gesture makes a difference in many ways. Holding the door for someone instead of rushing through, or complimenting them on their outfit, any little thing, can boost someones spirit. It can help them reconnect with the world and maybe perhaps for a moment, take their mind off of the negative events in their lives, whatever they may be. It also helps you. When you do something good, like allowing someone to merge in traffic, or asking to help them carry something, it makes you feel good. Your spirit gets a boost and helps to lighten your own load. Positivity is definitely contagious. Once you start it, you don’t want it to end. It just feels good. I recently was blessed to experience such a thing. My husband wanted to bring in cider and donuts to the nurses in the hospital which are caring for him as a thank you. It wasn’t enough donuts for everyone and only a simple gallon of cider to share, but it was a thought. Instead of being trapped in his own world of dealing with chemo, he was thinking of others…that’s just how he is. What was amazing was the reaction that came from the nursing staff. It was as if no one ever thanked them for what they do. Their spirits seemed lifted and they appeared to happier than the day before. If maybe only for the day, he made a difference in their lives with a simple gesture. So if today or tomorrow you can reach out to just one person and do something, anything, a simple gift of a smile, do it. You could be the reason for their good day. Who wouldn’t want that? What a great thing! You guys are amazing! Patrick I feel,it in my heart you are going to be fine! Denise, you are a wonderfully talented writer. Thank you for sharing your thoughts.